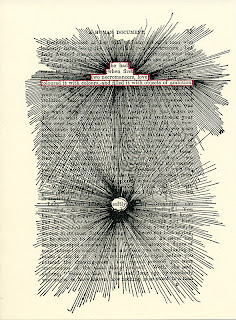 A Humument, page 33, 2007. A brief birthday calculation tells me I must get moving again with A Humument. The goal is to revise, edition by edition, the first working of the text as it appears in the first 1980 trade edition (which is itself substantially a reprint of the Tetrad Press limited edition of 1973). With bursts of activity as each edition approaches I have replaced over half the pages with new versions. 163 pages remain to be reworked. Since I announced my intentions in 1980, I have averaged only seven or so pages a year. At that sluggish rate I would have to live to the extremely unlikely age of ninety three with a steady hand and my wits about me to complete the task, so I must get a move on. All this but a prelude to showing the first page done in my seventies, revisiting the first page of all which started the work in 1966. 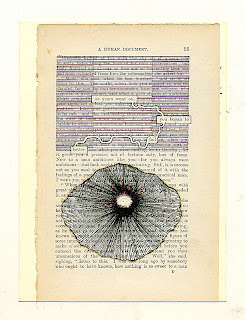 Here is that early version, appropriately retaining some of the original drawing, seen through a burnt hole in a newly extracted page. Twenty five years ago Bill Packer, reviewing a show of mine, characterised my attitude to my work saying I was like Little Jack Horner. It upset me at the time but I now see it as a fair observation. It is in that spirit of self congratulation I produce this present plum to show pleasure in demonstrating how great lines of the future (here from Beckett's Worstward Ho) lie latent in Mallock. For the connection with my own work see the lithographic portrait of Samuel Beckett. A Humument page 33, 1966. To see these "generations" is so inspiring. I love how the later version references the first, in the decoration as well as in the selected text. And p33 was *the* first page of all? I can't express how cool it is to learn that! Another question for you, Tom: Can't help but notice this new p33 page has been extracted from the book. I believe you began working on A Humument directly into that famous first, three-pence book, yes? I read somewhere that since then, you've garnered numerous additional copies. How much of the work still takes place directly in the book ("the" book or any of the copies) versus how much takes place on pages that are first removed from the book?